I've mentioned before that I think Drax is - fundamentally - a decent manager. 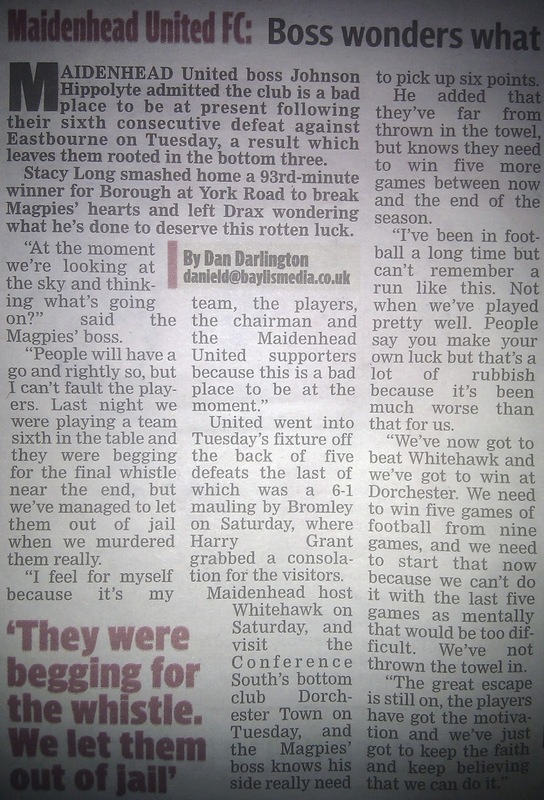 The bottom line, however, is that we're now staring relegation in the face and are surely odds on to start next season in the Southern league (where he found us) as Hayes & Yeading (his former club, sort of) - in all likelihood still in the Conference South - make themselves at home on the Bell End every other week. 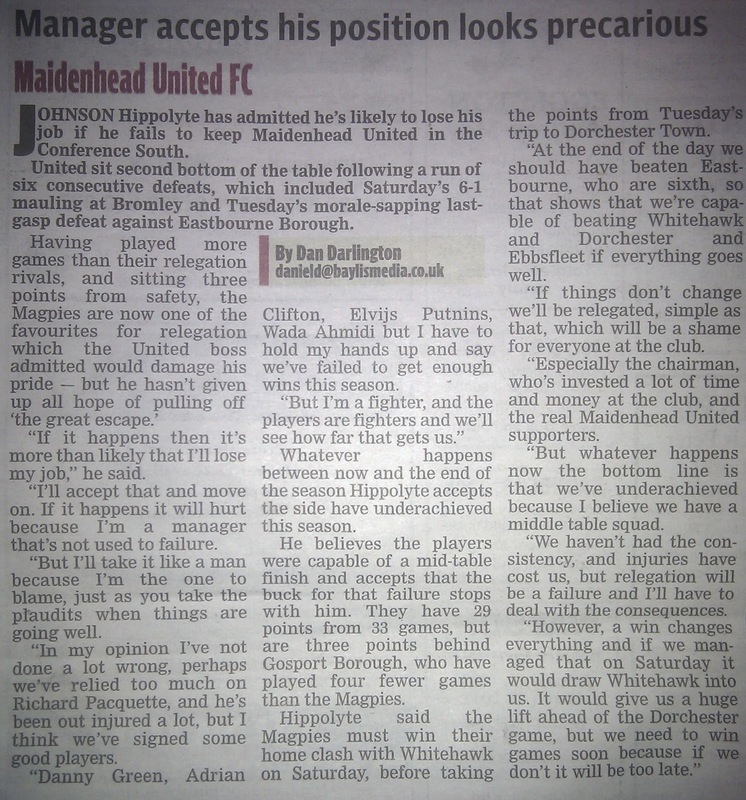 "I'm a manager that's not used to failure"
"In my opinion I've not done a lot wrong"
"The real Maidenhead United supporters"
"We need to win games soon because if we don't it will be too late"
"We're looking at the sky and thinking what's going on?" 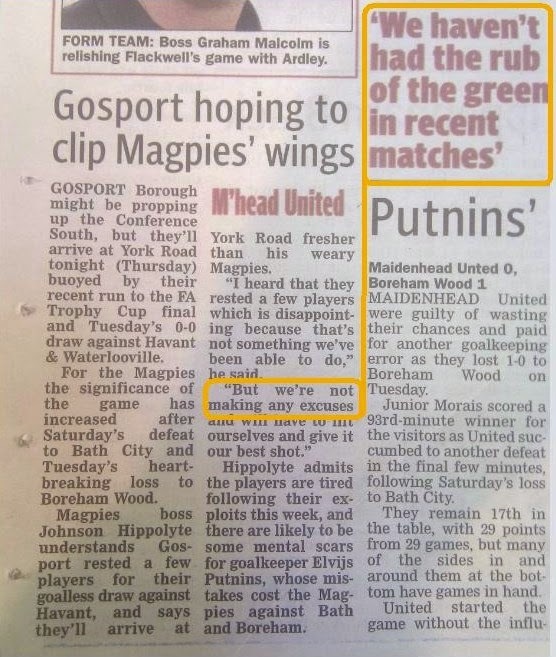 "They (Eastbourne) were begging for the final whistle near the end"
"(I) can't remember a run like this"
"People say you make your own luck but that's a lot of rubbish because it's been much worse than that for us"
"The great escape is still on"
PS. Anyone wondering about the blog post title obviously missed 'Inside Boodles', last Sunday, on Channel 4. TBF, PG didn't say much anything (while that sunshine yellow dress, IMO, rather suited UL). I've long suspected that Drax is in on the joke. Proof, last week, that the Advertiser is too? Define 'long-time' … and please explain how the 'it comes down to when are the FA going to allow us' comment is relevant, bearing in mind that others (Durham, Maidstone, Merthyr) already have one?? Laying down a new artificial pitch, Griffin said, is a phase of Maidenhead United's second five-year plan. An easy mistake to make, of course, as the current five-year plan isn't the first. I seem to recall Educated Left Foot revealing an outline of the previous one, following a meeting he'd had with PG, shortly after Pharmalink assumed control of the club back in 2006. As it is, this post - from July 2012 - still stands (pun intended). Counting (claret and blue) chickens? 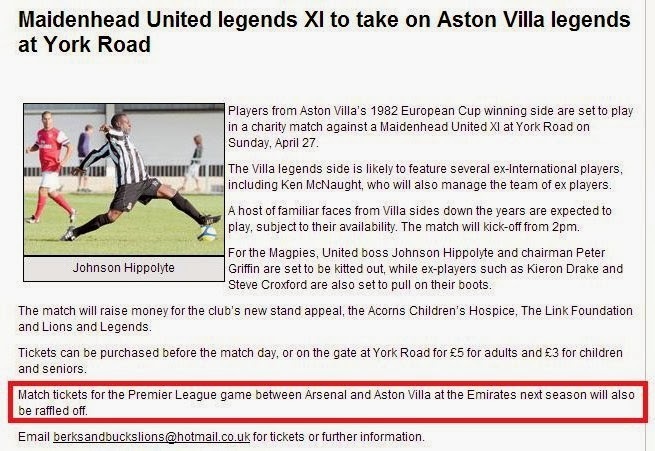 Regarding the prize, highlighted above, what happens if Villa are relegated?? Even allowing for today's result, it's not beyond the realms of possibility.